Note: The Approvals feature is only available in Enterprise plans. If your company operates in a highly regulated industry (like pharmaceuticals or medical devices), you may need a way to ensure the approval of new apps by multiple parties before they can be deployed on a production floor. Tulip has a feature called Approvals that creates rules for individual apps. In Tulip, the administrator that creates a new app is known as the “App Owner”. The App Owner can add “Approvers” from multiple departments to an individual app in order to make sure that the app complies with company requirements. 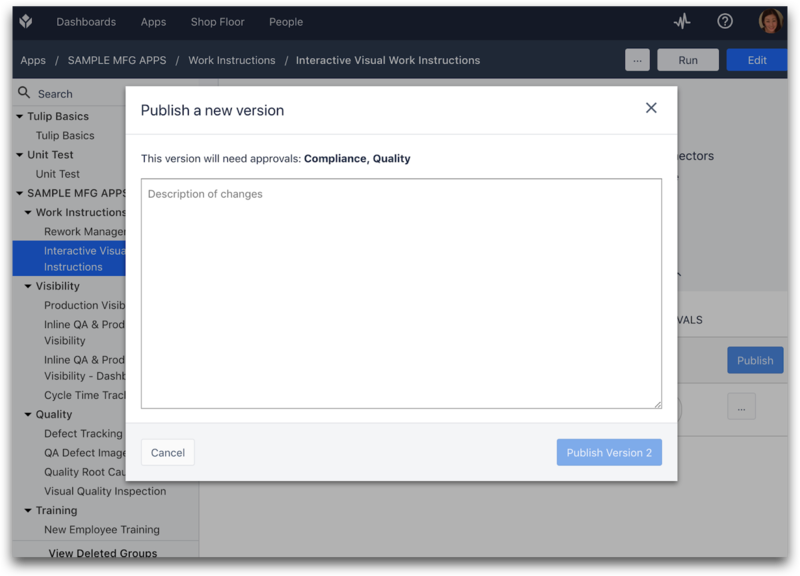 Once Approvers are added to an app, they must approve every new version of the app before it can be deployed to the shop floor. 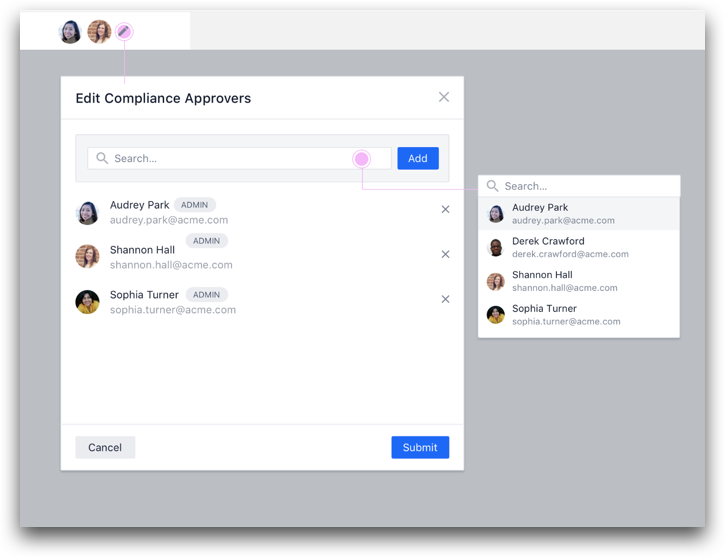 Here’s how you can configure Approvals and manage the publishing process in your Tulip Account. Before adding Approvers, you must specify the Approval Types you would like to create. Common examples include Compliance, Production and Operational Quality. 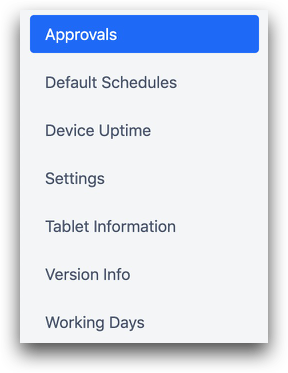 To create these categories, click the "Settings" option under your profile icon in the Menu Bar. Then, select "Approvals" in the menu on the left. From this screen, you can create new categories for Approvers. As an App Owner, you can manually add Approvers in the “Approvals” tab of the App Summary View. The Approver must be a Tulip Administrator. Once you add an Approver for a specific “Approval Type”, the Type will be automatically “enabled”. In order to choose Approvers, click the “Edit” symbol in the Approvers column. Then, use the search bar to select a Tulip Administrator. Once you successfully publish an app, the published version will be permanently available. Every time you publish the app, a new published version is created. But, there is only one development version. 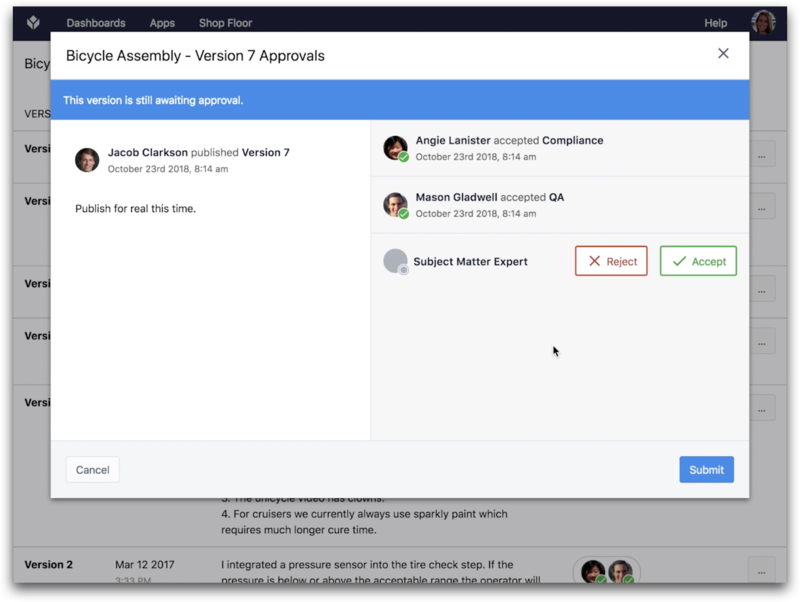 Since Apps require approval, the version with pending approvals will be un-editable while you wait for Approvers to approve or reject the new proposed version. If you want to make changes to a version with pending approvals, you must cancel the proposal, and then re-publish an updated development version. The Operator’s experience will not change until a new version is approved. When you are ready to publish a new version of your app, go to the “Versions” tab within the App Builder. Then click “Publish” next to the Development Version. Then, add some notes so the Approvers will know what changed. The App will now be in the “Published pending approval” state, and all Approvers will receive an email with instructions to review the newest version. If you are an Approver, you must navigate to the specific app that you need to review and then select the “Versions” tab. Then, click the icon in the “Approvals” column to either Accept or Reject the new version. Alternatively, you will receive an email when a new version of an app is published that requires your approval. The link in the email will lead you to the App Builder, where you can approve changes using the pill at the top of the screen. Then, you will be able to see the description of the new version and any history of approvals. Select “Accept” or “Reject” after you have reviewed the version. 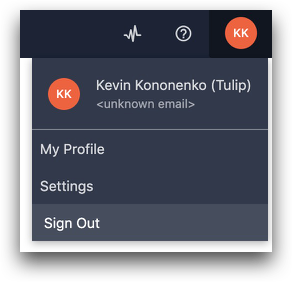 In order to review the app, an Approver will likely need to download and use the Tulip Player to inspect the app from the perspective of an operator. In order to successfully Accept the app, you must re-authenticate with your credentials to prove your identity. After all Approvers have approved a specific version, it will become the “Last Published Version”. By default, all Stations are set to run the most recent published version of an app. The next time that an operator runs the app in the Tulip Player, they will experience the updated version. Sometimes, you need to make significant changes to a development version. Or, you may want to create one version of the app, save your work, and create a second development version to allow teammates to compare two versions. This is where “Snapshots” will help. Snapshots allow you to save the development version as a separate version of the app. If you want to submit the snapshot for approval, you must “Restore” it as the development version, which will overwrite the existing development version. Snapshots are “locked” and view-only. In other words, they cannot be edited. Create a Snapshot by clicking the button in the Versions tab. Sometimes, you need to roll back an entire older version and start making edits based on that version. To do this, click “Restore” on the version you would like to begin editing. This will copy the older version into the development version. Keep in mind, your existing development version will be erased and replaced by this older version of the app. If your organization uses LDAP, the Approvers can be asked to re-enter their LDAP credentials before approving an app. Or, you can ask them to re-enter their Tulip credentials.